The Emotional Health Champions were recruited by NHS Hull CCG to promote a new website designed to help promote positive emotional health and wellbeing to children and young people living in Hull. The 11 Champions were all aged between 17 – 18 and worked tirelessly over a two week period to raise the profile of howareyoufeeling.org.uk to their friends, family and peers. The Champions promote the website in school assemblies, on Facebook, Twitter, Instagram and Snapchat and also handed out promotional items at Hull Fair. NHS Hull Clinical Commissioning Group (CCG) is hoping for success this week for two of its innovative patient and community-focused projects at the national Association for Healthcare Communications and Marketing (AHCM) awards, to be held on Thursday. The CCG Communications and Engagement team has been shortlisted in the awards for both the Healthier Hull Community Fund and children’s and young people’s emotional health website, http://www.howareyoufeeling.org.uk, launch campaign. The Healthier Hull Community Fund faces tough competition from the likes of Salford CCG and Guys and St Thomas Foundation Trust, to name but a few, in the ‘Best Engagement or Consultation’ category. The CCG awarded £438,772 in grants to 99 local health and wellbeing related projects through the Healthier Hull Community Fund in March 2016. Funded groups have spent the past year demonstrating how their work helps to keep local people healthy. Funded projects included those designed to use arts to tackle isolation, healthy cooking classes, access to exercise and supporting people with emotional health and wellbeing. The How are you Feeling? Launch is up against NHS England, London North West Healthcare NHS Trust and other NHS organisations in the ‘Best Storytelling’ category. The website was designed with young people in Hull, for young people in Hull, and aims to act as a resource for children and young people who want to look after their emotional health and wellbeing and learn about local services available to them. The launch event saw the Hull 2020 Champions attend Hull Fair to distribute promotional wristbands and share their ‘How are you Feeling?’ story across social media to spread the word about the new website to their friends, families and peers. The award winners will be announced on Thursday evening, follow @NHSHullCCG on Twitter to hear the news first. Hull 2020 Champions ask Hull Fair revellers ‘how are you feeling?’ as part of an NHS Hull Clinical Commissioning Group (CCG) and Hull City Council website launch. 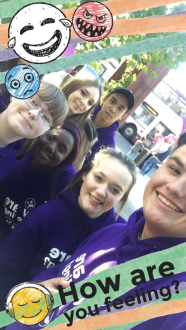 The Hull 2020 Champions, a group of ten 17 – 18 year olds, have been working to promote the website to their peers both at Hull Fair and online; giving away freebies, sharing Snapchat selfies and posting to Facebook, Twitter and Instagram. The website, http://www.howareyoufeeling.org.uk, has been designed by the CCG and Council with young people, and aims to help youngsters across Hull know how to look after their emotional health, as well as where they can go to get help when things become too much. The website is also being promoted on social media by the Champions who have received mental health awareness and myth busting training provided by Mind Hull and East Yorkshire. Children, young people and parents can visit http://www.howareyoufeeling.org.uk for more information and advice around being emotionally healthy; including top tips for good emotional wellbeing, practical advice for dealing with stress or low mood, and a whole host of other information and advice around what is available to youngsters in Hull and how to access it if they need it.